When a place is this beautiful, I find it hard to come up with words that will do it proper justice. 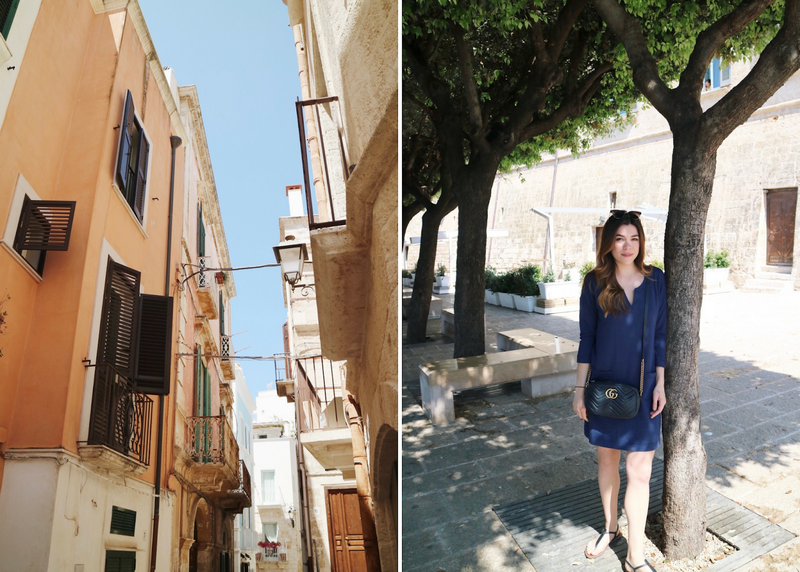 However, I loved the seaside town of Polignano a Mare so much that I just had to share a mini travel guide with you. Because - trust me - once you're done scrolling through these photos you'll find your fingers scurrying to type this town's name into your favorite booking site. 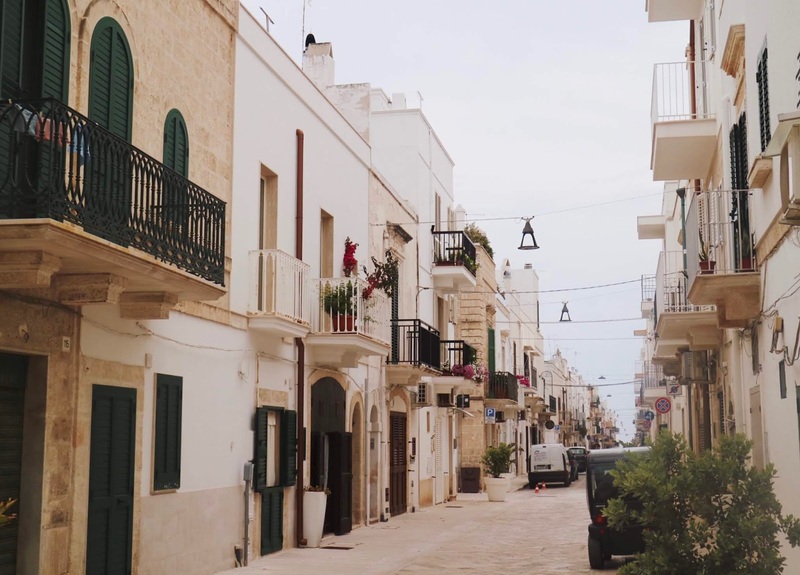 Puglia had been on my travel list for quite some years, as it was one of the few remaining regions of Italy that I had been desperate to explore but hadn't yet had the chance. When choosing which towns to call home-base while there, I instantly thought of this famous restaurant in a cave, and knew I had to pay a visit to this place dangling over the cliffs of the Adriatic Sea. After a bit of searching, I found the Gioví Relais hotel and spa on a website that offers bookings for small luxury hotels and ended up reserving a room through Expedia. To be honest, I found it difficult to choose a place to stay here, as it's a small town with fewer hotel reviews, but this hotel way exceeded my expectations. The Gioví Relais is a boutique hotel with suite-style rooms that are bright and airy, with high, vaulted ceilings and very tasteful beach decor. The hotel also offers a daily breakfast on their rooftop, which boasts views of the town's rooftops sweeping out over the Adriatic. I loved how spacious the room was, and appreciated the updated bathroom and big shower - which by Italian standards - were certainly luxurious. Ah, glorious Pugliese cuisine! I know this sounds so dramatic, but seriously, the food in Puglia is incredible...and so cheap for Europe. For lunch, we ate at Casa Mia Trattoria Pizzeria and Trattoria Pizza Neuro twice, each. They are both located in the old main square, and offer extensive menus complete with delicious pizzas, pastas, fish, meat, salads and more. Some of my favorite restaurants for dinner were Meraviglioso, a seafood restaurant overlooking the ocean, and Ristorante Antiche Mura, another seafood-centric restaurant in a trattoria-like setting. Both of these restaurants were incredible and also offered pasta dishes or beef for those not into eating fish. Of course, I can't write this post without mentioning the social-media famous Grotta Palazzese; this is the restaurant I mentioned earlier that's set inside of a cave overhanging the ocean. 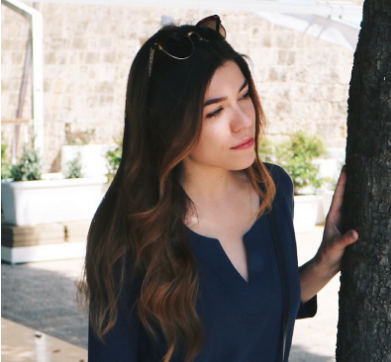 First, I will say that this is an experience more than anything else; you literally eat in a grotto overlooking the turquoise waters of the Adriatic. But, I do also have to say - while I made a point to eat here during my trip - it was by far the most underwhelming meal I ate during my time in Puglia, and also the most pricey (by hundreds of dollars for just one meal). It's strange, because the food is prepared in such an upscale manner, but it pails in comparison to the delicious local options that aren't so geared toward tourists. That being said, if you do want to experience this restaurant, just know in advance that that's precisely what it is...an experience that's all about the location. If not, then you can rest knowing you aren't missing out on an exquisite meal. 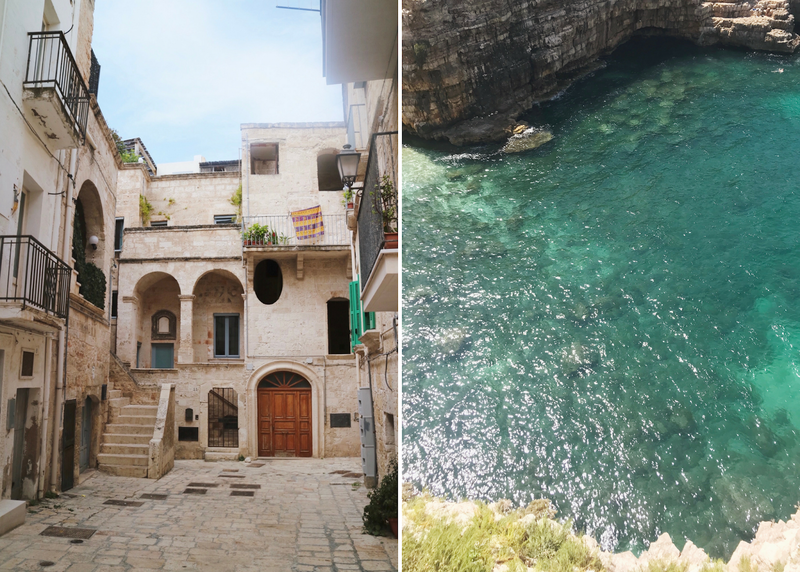 I loved that, in Polignano a Mare, I didn't feel the pressure of a typical "go, go, go" European vacation...where you're trying to see as much as possible in a short period of time. It was more relaxed, but there was plenty to occupy our time. 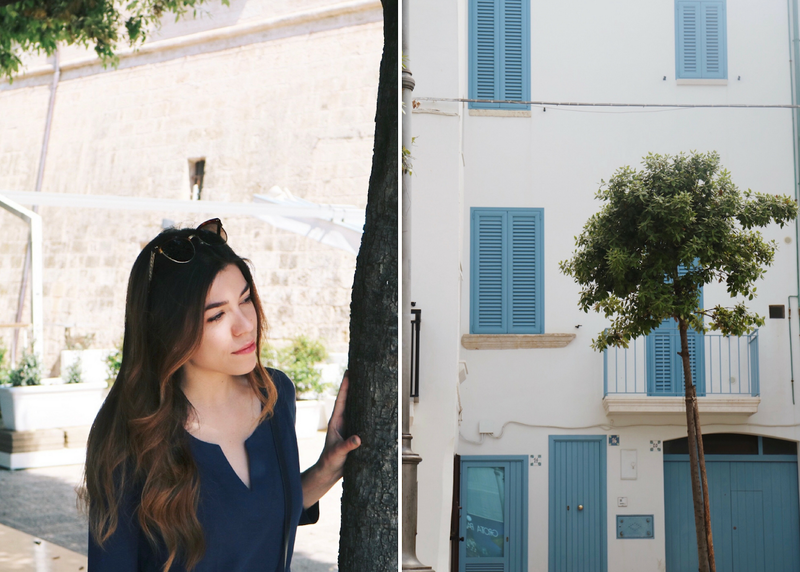 We'd spend the beginning of each day wandering the town and admiring the views and then we'd head down toward the old Roman bridge and beach. The main beach is beautiful and provides plentiful people-watching, but I'd also suggest walking off the beaten track; what you'll find is a series of ravines with empty beaches perfect for exploring and taking in the views. From Polignano a Mare, we also took a trip to the Grotte di Castellana, which is a system of caves over 3km long that's located in the Itria Valley. 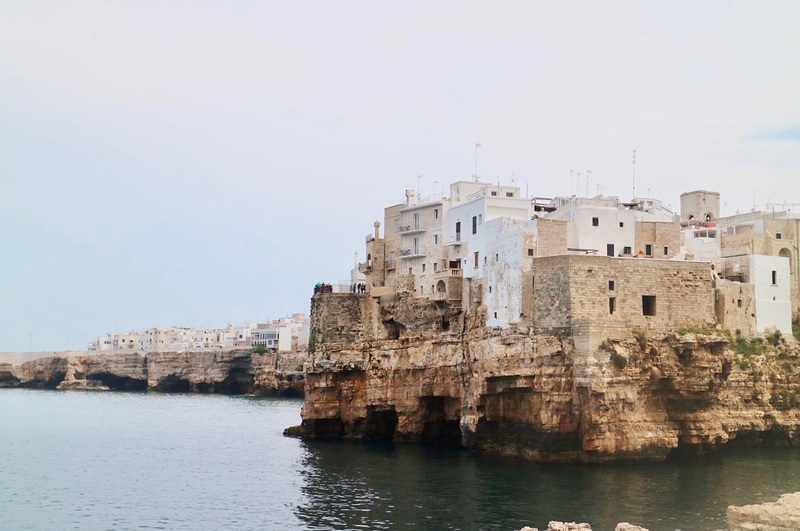 I'm surprised that I hadn't heard of this attraction prior to going to Polignano, as it was a really incredible experience to be able to explore miles of underground caves made up of stalagmites and stalactites. Picture crevices dripping in pink, red and white crystal-like formations - so cool! We also visited Alberobello, the charming whitewashed village that offers the highest concentration of trulli houses in the region. This town is incredible; I'd highly recommend at least a day trip there, as the ancient, conical-roofed houses that make up the town are really something you won't see elsewhere. 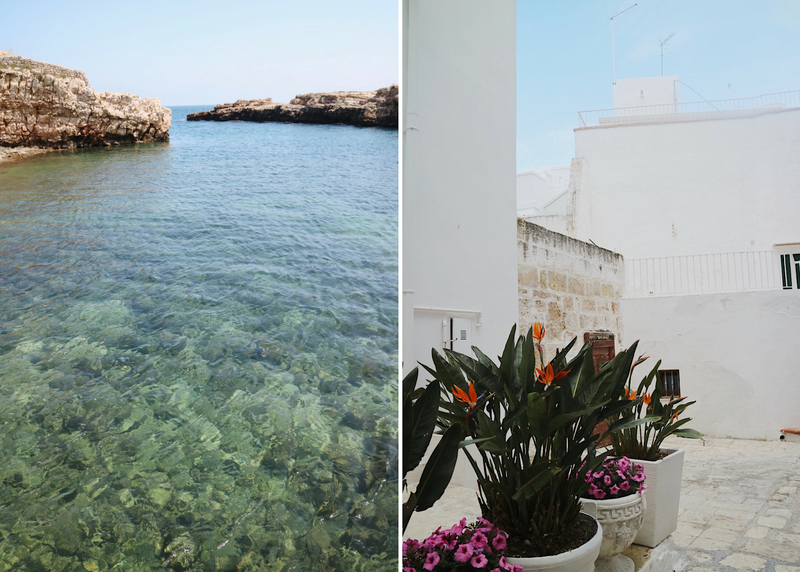 Have you visited Polignano a Mare before? 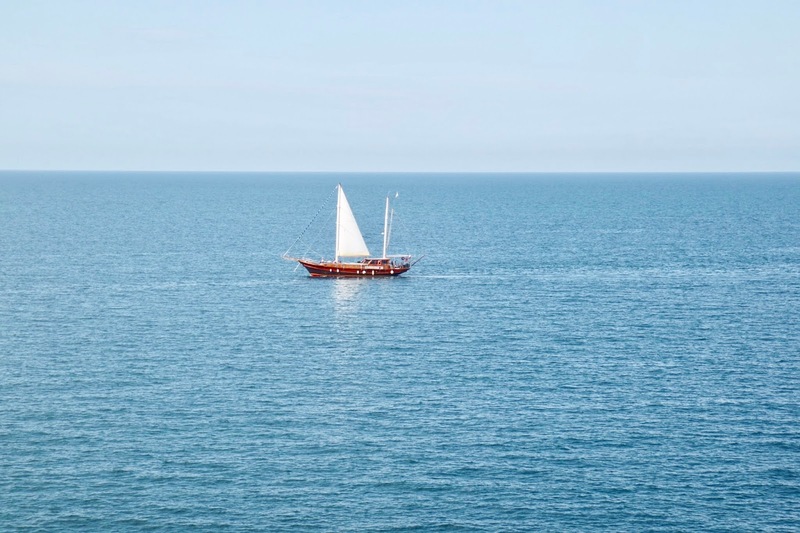 If not, I hope this post has convinced you to add it to your bucket list!